李浩, 宁煦棋, 鹿畅, 涂辉招. 分时通勤缓解高峰拥堵的作用机理及效用[J]. 同济大学学报(自然科学版), 2019, 47(3): 353-359. DOI: 10.11908/j.issn.0253-374x.2019.03.008. Abstract: Commuters' travel preferences and road network traffic states synthetically have direct impact on the efficiency of travel demand management measures. 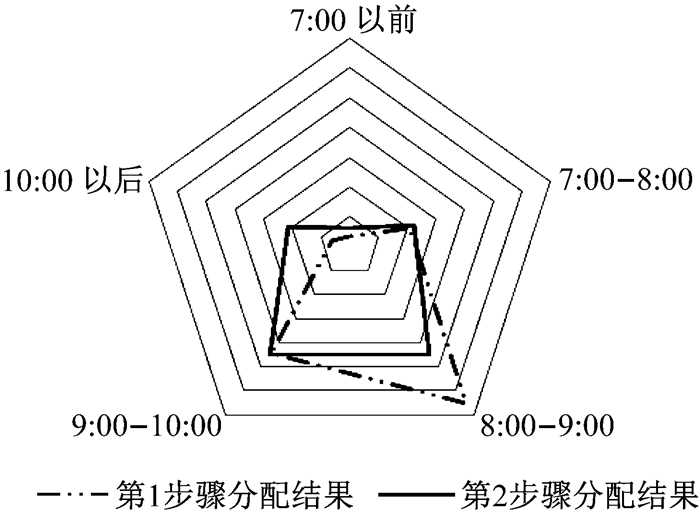 On the basis and analysis of the deficiencies and merits of staggered work hours and flexible work arrangement, a new demand management named time segmenting commuting was proposed which includes three periods and two adjustments. The new management allows traffic managers arrange work start time distribution for all companies with the consideration of commuter's preferred work start time. 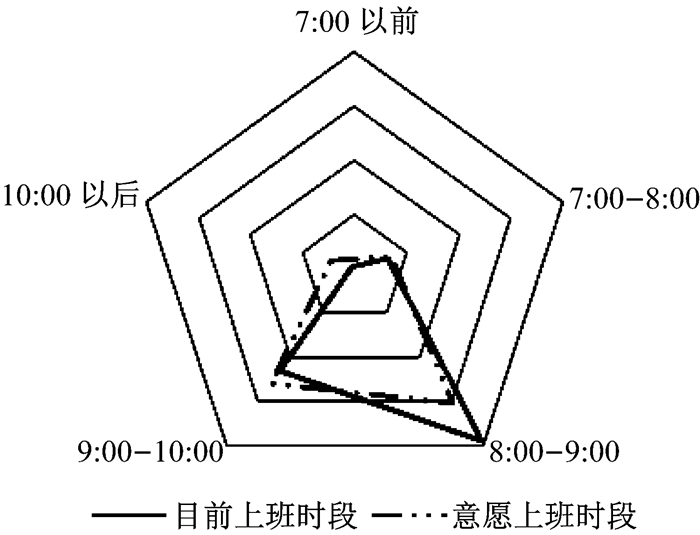 With collected preferred work start time and commute information of representative commuters in Shanghai, the acceptability of time segmenting commuting has been investigated. 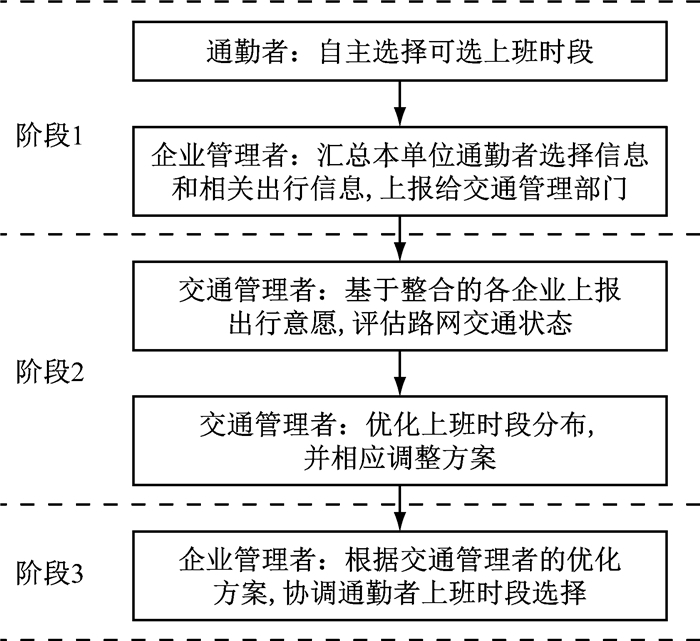 Then the work start time distribution was adjusted and analyzed according to the proposed adjustment which improved its efficiency and feasibility. 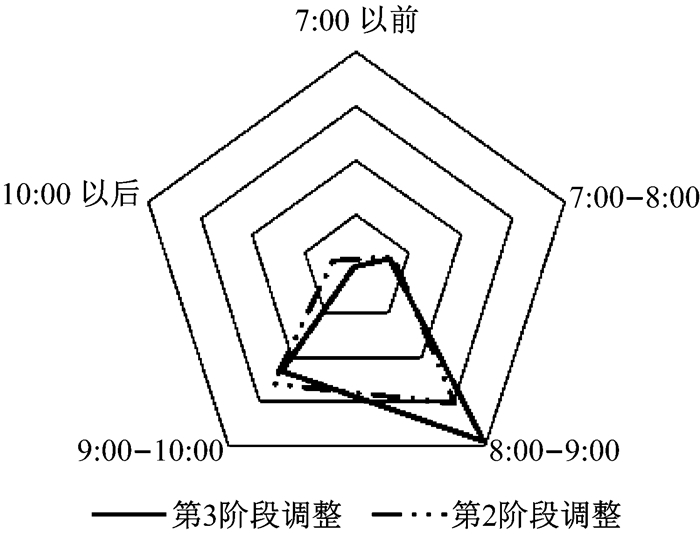 弹性工作时间制从提出开始就得到了诸多学者的关注.研究表明弹性工作时间制影响通勤者出行时间选择[1-2]，可达到缓解拥堵的效果[3-5].由于弹性工作时间制赋予通勤者较大的时间选择灵活性，交通系统状态不受管理人员的控制，其缓解拥堵的效果依赖于弹性工作时间制的实施规模及通勤者的出行行为.通过研究集中4 d工作40 h的弹性工作时间制形式对交通状态的影响，得出这种制度虽然在非工作日减少了交通出行需求，但会加剧工作日高峰时段的交通拥堵.利用2009年美国的国家家庭出行调查(National Household Travel Survey, NHTS)数据，分析弹性工作时间制对洛杉矶和旧金山的通勤者出行行为的影响，发现采用弹性工作时间制的通勤者倾向于晚出发，虽削弱了原有的通勤高峰，但却容易造成新的集中出行.弹性工作时间制实施后较难进行以系统最优为目的的出行管控.实践也表明，制定需求管理措施时考虑通勤者的出行异质性，将有利于管理措施的实施并能发挥更好的效果. 依照步骤2的调整方法进行进一步调整，调整后的上班时段分布情况如图 4所示.从图 4中可以看出，经过步骤2的调整所有时段的通勤者数量分布较为均衡，有显著的削峰效果.其中，有82人的调整间隔为2 h，35人的调整间隔为1 h.